The long coastline of Spain, combined with the two archipelagos, the Balearics and the Canaries, ensures that fresh fish and shellfish are ubiquitous elements of the Spanish table. This section showcases only a small number of the dishes that cooks and chefs throughout the country regularly prepare as seafood main courses, such as suquet, the seafood stew of Catalonia; Dorada a la Sal, fish baked in a salt crust from Murcia; and txipirones en su tinta, Basque-style squid in its own ink. 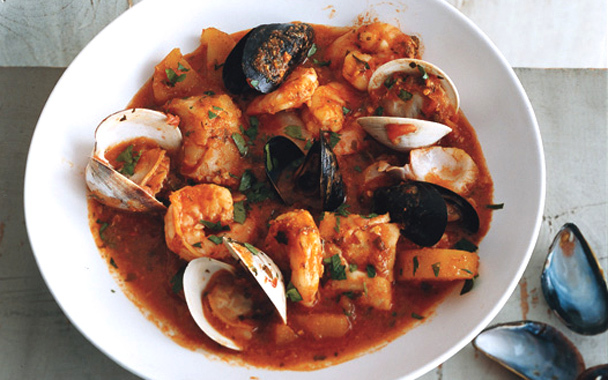 Spaniards believe that some of their country's fish and shellfish taste better when eaten in their place of origin, such as the angulas, or baby eels, of the north; the carabineros, or jumbo red shrimp, of the south; and the salmon of Asturias. But salt cod, sometimes called the 'inland fish', crosses all borders. 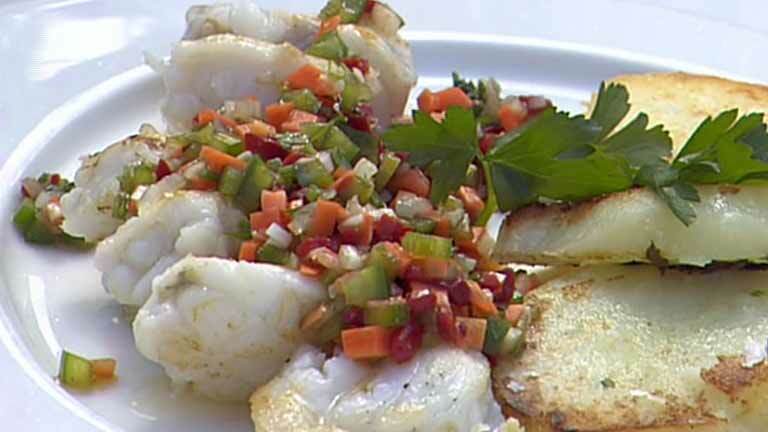 In this section, you will find some regional dishes that star salt cod. My favorite is the Basque Bacalao al pil-pil, in which the hard dried fish turns velvety and delicious when simmered in a cazuela with olive oil. 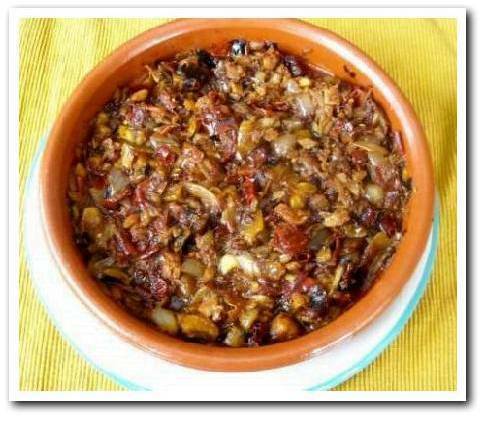 Bacalao con alioli from the Balearic Islands pairs salt cod with the region's emblematic sauce, while in tiznao from La Mancha, salt cod and vegetables are grilled, chopped, and married with chiles and olive oil. Finally, bacalao al ajoarriero from Navarra, named after the ajoarrieros or 'muleteers', who once transported salt cod along with other foods across Spain, calls for braising the cod with potatoes, tomatoes, and eggs. Suquet: suquet is the diminutive form of suc, or 'juice', in Catalan, which means that this wonderfully flavored dish is more correctly called juicy fish stew. The fish and shellfish used vary from cook to cook, and so does the amount of liquid - in fact, some people call this a stew, while others call it a soup - but saffron and almonds are typically part of the mix. Tiznao Manchego: This is arguably the most singular dish of La Mancha, and it is quite different from other cod preparations in Spanish cooking. It is a little labor-intensive, too, but it is well worth the time. Here, the salt cod, in contrast to most recipes, is not desalted before it is used, but is instead held under running water to wash the salt from the surface. Miraculously, the dish is not salty. The cod simply yields its salt to the rest of the ingredients, lending the dish the perfect amount of seasoning. Burrida de Raya. Fish soups with names similar to this one are common in the Mediterranean, with the type of fish and the seasoning varying with the locale. For example, Provençal cooks make bourride and serve it with the rust-colored sauce known as rouille, while Ligurian cooks make buridda and accompany it with fried bread. The burrida of the Balearics calls for skate in an allioli-enriched stock and thin slices of country-style bread. 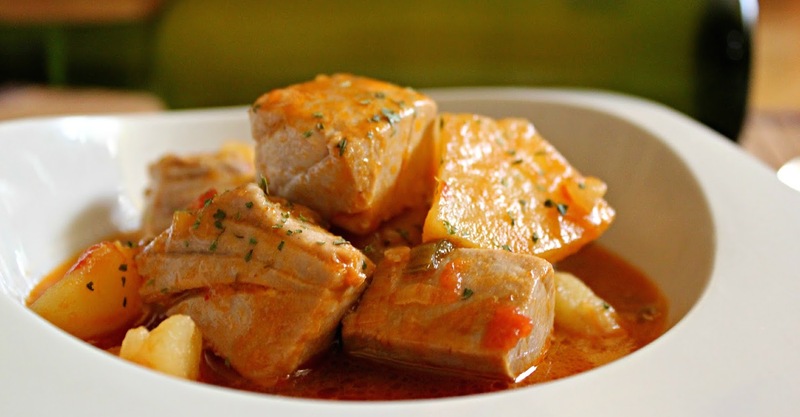 Atún encebollado is one of the favorite recipes in Cantabria. Use bluefin Tuna (Atun) for this recipe to get the best results. Spiced Clams: Spanish clams, specially in the North, are much larger than clams found elsewhere, and have more succulent bodies. This modern recipe uses Arab spicing to make a hot dip or sauce. 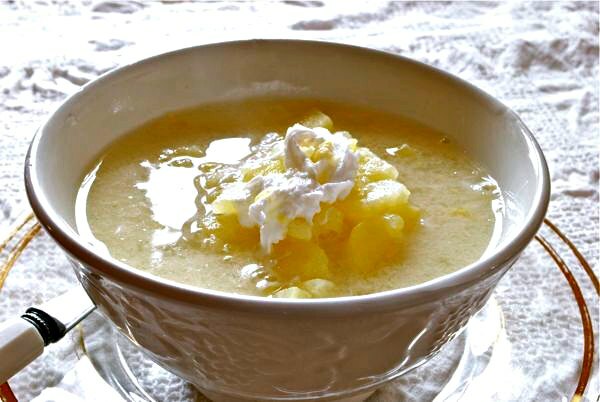 Serve with plenty of fresh bread to mop up the delicious juices! Ceviche: You can use almost any firm-fleshed fish for this Spanish influenced dish, provided that it is perfectly fresh. 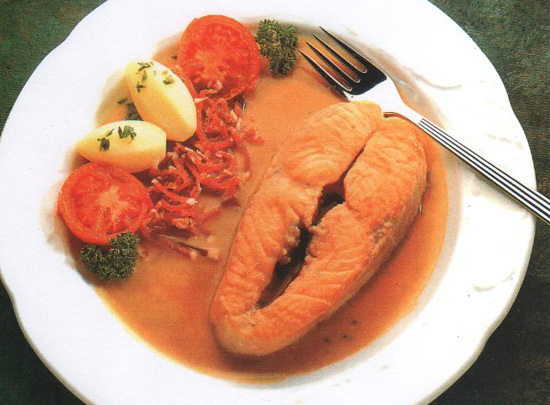 The fish is 'cooked' by the action of the acidic lime juice. Adjust the amount of chilli according to your taste. 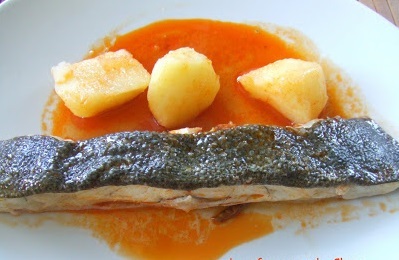 Salmón a la Ribereña: Asturians cook salmon in many different ways, but salmon baked with cider, a staple of Asturian gastronomy, is arguably the most representative. Though the usual cut for this recipe is salmon steaks, I often prepare it with fillets instead. Prawn croquettes: Croquetas are ubiquitous in Spain, although they most likely originate from the French 'croquettes'. Their beauty lies in the bechamel base which is then mixed with your particular ingredient of choice to give it a characteristic flavor. The possibilities are almost endless - here we have used prawns. Empanadas: bread pies stuffed with shellfish, fish or meats, are iconic of Galician cuisine. The crusts and fillings vary from place to place, and nearly every Galician family, restaurant, and tavern claims to have the secret formula for making the best version. Of the many empanadas I have tasted in this beautiful northwestern region, these ones are my favorites - their crust is consistently delicate and delicious. 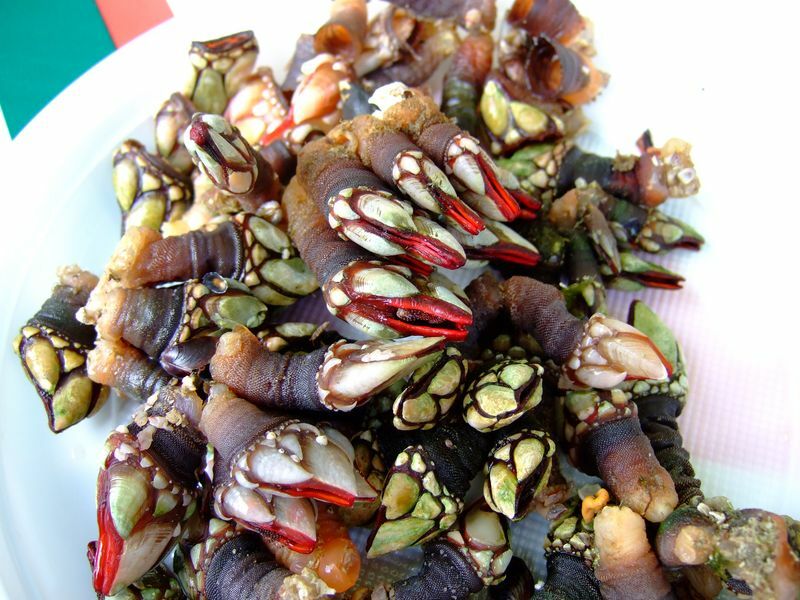 Mussels Vinaigrette: Steamed mussels are dressed with a flavorful vinaigrette in this colorful tapa. It is an ideal treat for a party or any event with lots of people attending. Boquerones en Escabeche: Moorish Pickled Anchovies This is an old, old way of preserving small fish which has survived into modern times because it is so delicious. Gazpachuelo: The vinegar in this warm soup is the link wtih gazpacho. It is suprisingly good and easy to make, so is associated in Spain with emergencies! The idea is to stretch fish for one or two people to make soup for six. It is better made with fish stock, but still good made with water. 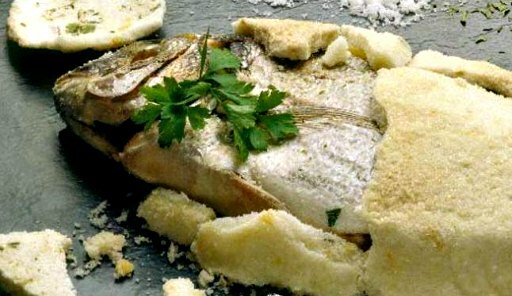 Dorada a la sal: Dorada - or gilt-head bream- is usually prepared by baking it in a salt crust. Most Spanish food experts believe the method originated in Murcia, but it is now common practice in Andalusia as well. Don't be put off by the large amount of salt. 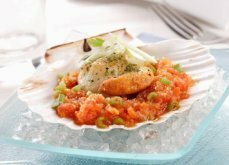 It seals in the juices of the fish, resulting in a succulent dish that delivers pure fish flavour without a trace of saltiness.